Arranging a Shadow Day is a great way for parents of prospective students to get an insight of our day to day operations. As a Parent you can schedule a tour visit classrooms and speak with teachers and observe our classes. Scheduling a Shadow day is a great way for your child to spend time in the classroom with a student buddy and see what’s happening in a day at SS. Cyril & Methodius. 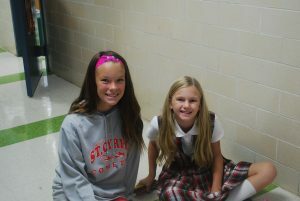 Shadow days are available for PreK through 7th grade. Arranging a tour of the school or setting up a shadow day is a great way for parents of prospective students to get an insight of our day to day operations. As a Parent you can schedule a tour visit classrooms and speak with teachers and observe our classes. Scheduling a Shadow day is a great way for your child to spend time in the classroom with a student buddy and see what's happening in a day at SS. Cyril & Methodius. Shadow days are available for PreK through 7th grade. Please select your interest. You may schedule a Shadow Day after your tour. If you would like, you may pick several dates and we will contact you to confirm a date. Please select the grade or grades you are interested in.